Glenn Flood is a dynamic, energetic chef who has worked with some of the biggest names in the culinary world. Cutting his teeth in food media during the channel 10 hit reality series ‘Jamie’s Kitchen Australia’ Glenn took up the mantle of fellow chefs Tobie Puttock and global icon Jamie Oliver to inspire disadvantaged youth through food at Fifteen Melbourne. As Training and Development Chef, Glenn designed and implemented a unique training program that not only taught young people the skills to become first class chefs but also had a profound effect on every aspect of their lives. 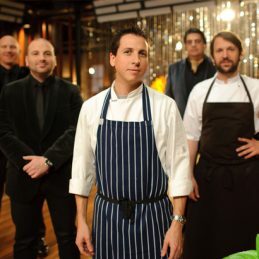 In 2011 Glenn led the MasterChef test kitchen team as food producer. His affiliation with the hit series has been ongoing since day one. Initially involved with the recruitment of judges Gary Mehigan, George Calombaris and Matt Preston, Glenn also put contestant hopefuls through their paces leading into the competition. The subsequent ratings success has lead to Junior MasterChef, as Australia searches for an 8 to 12 year old who’s passion for food will drive them to culinary success. Inspiring the next generation of young cooks, Glenn is the consultant chef across the national contestant recruitment, setting challenges, mystery boxes, innovation tests and ensuring the safety and skills of the young cooks. Now taking up the role of Food Producer for MasterChef series 3, Glenn and the food team will be hard pressed to raise the benchmark for the amateur culinary world on the highest ranking show in Australian television history….but we all love a good challenge! Constantly working with a selected group of quality companies brings a diverse range of clientele and projects to Glenn, allowing him to utilise his skills as a chef, educator and facilitator. He has spoken to government bodies, philanthropy organisations, corporate & private groups. Glenn has appeared on Channel 10’s 9am with David and Kim; Channel 7’s Coxy’s Big Break, the 7pm Project, Triple J, regional radio and featured in many newspapers for his innovative, inspiring work. Glenn’s infectious attitude, gentle approach, passion for food & zest for life has been and will continue to be an inspiration to young chefs everywhere. To see him in action on the MasterChef set click here.